The Western District police station in Baltimore, Md., seen in July, was the backdrop to violent clashes between police and rioters in 2015, following the death of Freddie Gray. For the third year in a row, Baltimore, Md., has had more than 300 murders, reaching a new record of murders per number of residents in 2017. Some residents attribute the high murder rate to relaxed police patrols in the city following high-profile cases of police brutality. Officers have backed off in neighborhoods, like the one where Freddie Gray was arrested. The Rev. Kinji Scott, a pastor in Baltimore who's held positions in local city government, says the opposite needs to happen. "We wanted the police there," Scott says. "We wanted them engaged in the community. We didn't want them beating the hell out of us, we didn't want that." He's among activists who are calling for police reform to reduce the violence in Baltimore and several other high-crime cities across the U.S. that he says haven't seen change. That change begins with a conversation between the communities directly involved, Scott says. "We need the front line police officers and we need the heart of the black community to step to the forefront of this discussion," he says. "And that's when we're going to see a decrease in crime." When you think about young people who are out here facing these economic challenges and are homeless and living places that are uncertain, and you're a parent — you're scared. Not just for yourself really, but for your children. The average age of a homicidal victim in Baltimore City right now is 31 years old. We had a young man who attended one of the prime high schools, [Baltimore Polytechnic Institute], Jonathan Tobash, and he was 19 years old, he was a Morgan State student. And he was killed on his way to the store. That's the state of Baltimore right now. What I wanted to see happen was that people would be able to trust the relationship with our police department so that they would feel more comfortable. We'd have conversations with the police about crime in their neighborhood because they would feel safer. So we wanted the police there. We wanted them engaged in the community. We didn't want them beating the hell out of us, we didn't want that. It's not. I lost my brother in St. Louis in 2004; just lost my cousin in Chicago. No it's not unique, and that's the horrible thing. The primary thrust nationwide is what President Obama wanted to do: focus on building relationships with police departments and major cities where there had been a history of conflict. That hasn't happened. We don't see that. I don't know a city — Baltimore for certain — we've not seen any changes in those relationships. What we have seen is that the police has distanced themselves, and the community has distanced themselves even further. So the divide has really intensified, it hasn't decreased. And of course we want to delineate the whole culture of bad policing that exists — nobody denies that — but as a result of this, we don't see the level of policing we need in our community to keep the crime down in our cities that we are seeing bleed to death. I am not. Because I look at the conclusion of 2017, these same cities — St. Louis, Baltimore, New Orleans and Chicago — these same black cities are still bleeding to death and we're still burying young men in these cities. I'm a preacher, I want to be hopeful, but not as it stands, no. Not until we really have a real conversation with our front line officers in the heart of our black communities that does not involve our people who are "leaders." We need the front line police officers and we need the heart of the black community to step to the forefront of this discussion. And that's when we're going to see a decrease in crime. Emma Bowman adapted this story for the Web. This year, Baltimore has had well over 300 murders for the third year in a row. 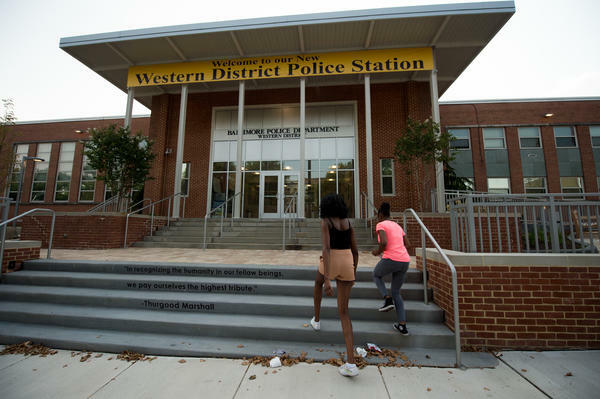 Some activists say the high murder rate is because police have backed off and relaxed patrols in neighborhoods like the one where Freddie Gray was arrested. Gray was a black man who died while he was in the back of a Baltimore police van in 2015. Reverend Kenji Scott lives in Baltimore. He's held positions in local city government and is a pastor and community activist. KINJI SCOTT: When you think about young people who are out here facing these economic challenges and are homeless and live in places that are uncertain and you're a parent, you're scared, not just for yourself really but for your children. I mean, the average age of a homicide victim in Baltimore City right now is 31 years old. We had a young man who attended one of the prime high schools, Poly. His name was Jonathan Tobash, and he was 19 years old, was a Morgan student. And he was killed on his way to the store. That's the state of Baltimore right now. FRAYER: What do you see? Is this something that happens in the middle of the night, or is this something that when you live there you see this? SCOTT: You see this all the time. You're talking about homicides in the middle of the night. No. The average homicide in Baltimore happens during the day. We have broad daylight shootings all over the city. You've had shootings and people have been shot, gunned down and killed in front of the police station. FRAYER: After the death of Freddie Gray, yourself, families of victims, didn't you want police to back off? SCOTT: No. That represented our progressive, our activists, our liberal journalists, our politicians. But it did not represent the overall community because we know for a fact that around the time that Freddie Gray was killed, we start to see homicides increase. We had five homicides in that neighborhood while we were protesting. What I wanted to see happen was that people would build a trust relationship with our police department so that they would feel more comfortable with having conversations with the police about crime in their neighborhood because they would feel safer. So we wanted the police there. We wanted them engaging the community. We didn't want them there beating the hell out of us. We didn't want that. FRAYER: Do you think your experience with high murder rate in Baltimore is unique? SCOTT: No, it's not. It's not. I lost my brother in St. Louis in 2004. I just lost my cousin in Chicago. No, it's not unique, and that's the horrible thing. FRAYER: It's been three and a half years since Ferguson, Mo., since the killing of Michael Brown, since the Black Lives Matter movement was born to demand reforms to policing. What did they put on the table, and has it worked? SCOTT: The primary thrust nationwide is what President Obama wanted to do - focus on building relationships with police departments in major cities where there has been a history of conflict. That hasn't happened. We don't see that. I don't know a city that I've heard of - Baltimore for certain. We've not seen any changes in those relationships. What we have seen was that the police has distanced themselves, and the community has distanced themselves even further. So there is - the divide has really intensified. It hasn't decreased. And of course, we want to delineate the whole concept of the culture of bad policing that exists. Nobody denies that. But as a result of this, we don't see the policing - the level of policing we need in our community to keep the crime down in these cities that we're seeing bleed to death. FRAYER: Are you optimistic for 2018? SCOTT: I'm not because as I look at the conclusion of 2017, these same cities - St. Louis, Baltimore, New Orleans and Chicago - these same chocolate (ph), these same black cities are still bleeding to death, and we're still burying young men in these cities. I want to be hopeful. I'm a preacher. I want to be hopeful. But as it stands, no, not until we really have a real conversation with our frontline officers in the heart of our black communities that does not involve people who are, quote, unquote, "leaders." We need the frontline police officers, and we need the heart of the black community to step to the forefront of this discussion. That's what's important. And that's when we're going to see a decrease in crime. FRAYER: Reverend Kinji Scott in Baltimore, thank you very much. SCOTT: Thank you. Transcript provided by NPR, Copyright NPR.